Distributed display environments (DDEs) allow use of various specialized devices but challenge designers to provide a clean flow of data across multiple displays. Upcoming consumer-ready head-worn displays (HWDs) can play a central role in unifying the interaction experience in such ecosystems. In this paper, we report on the design and development of Gluey, a user interface that acts as a ‘glue’ to facilitate seamless input transitions and data movement across displays. Based on requirements we refine for such an interface, Gluey leverages inherent headworn display attributes such as field-of-view tracking and an always-available canvas to redirect input and migrate content across multiple displays, while minimizing device switching costs. We implemented a functional prototype integrating Gluey’s numerous interaction possibilities. From our experience in this integration and from user evaluation results, we identify the open challenges in using HWDs to unify the interaction experience in DDEs. Marcos Serrano, Barrett Ens, Xing-Dong Yang and Pourang Irani. 2015. 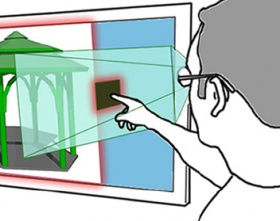 Gluey: Developing a Head-Worn Display Interface to Unify the Interaction Experience in Distributed Display Environments. In Proceedings of MobileHCI'15, August 24, Copenhagen, Denmark. ACM, 161-171.